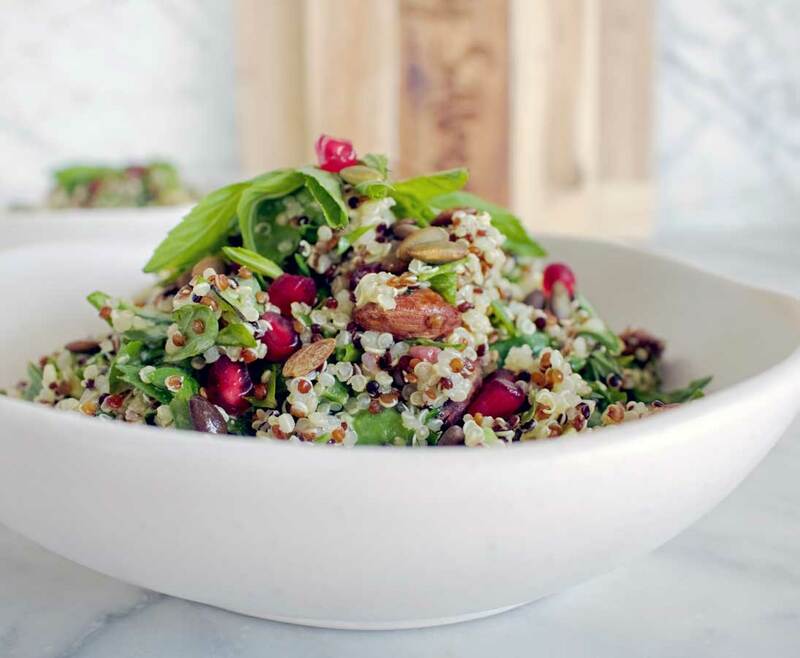 Are you in need of a Christmas salad recipe? 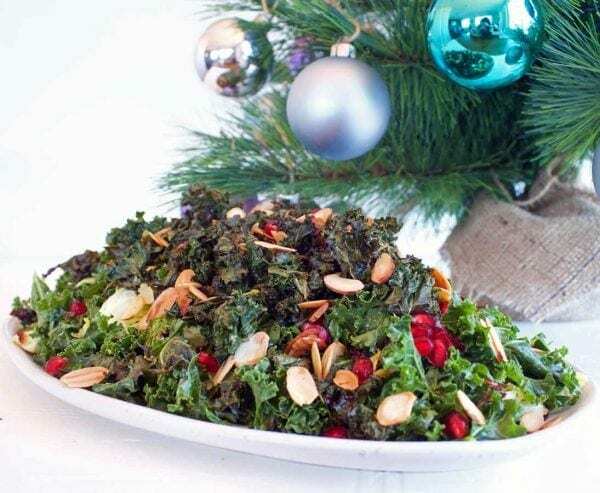 If you are spending Christmas in the sunshine the Crispy Kale & Brussels Salad is a tasty and fresh addition to your festive menu. If you aren’t spending Christmas in the sunshine however, you definitely aren’t excluded from making this either (you can actually make it anytime you like!) 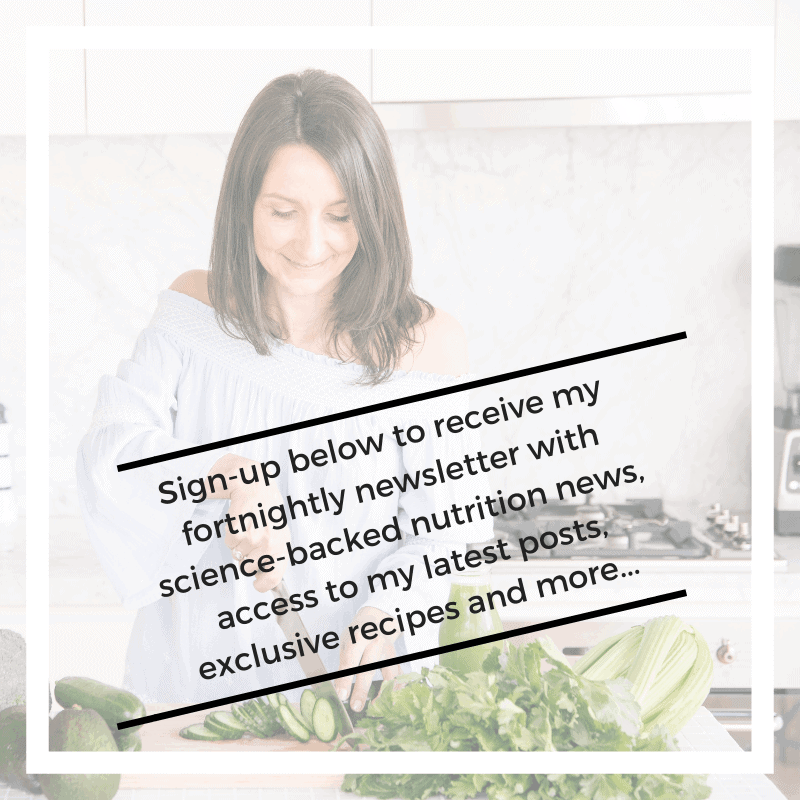 Its easy to prepare and the ingredients are jam-packed with nutrients and health benefits, with the mix of crispy and fresh kale creating a great combo! Your liver will LOVE all of these detoxifying ingredients! Christmas is typically an indulgent time of year and a time of year when lots more social means a few extra glasses of wine (me included, so there are no judgments here!). 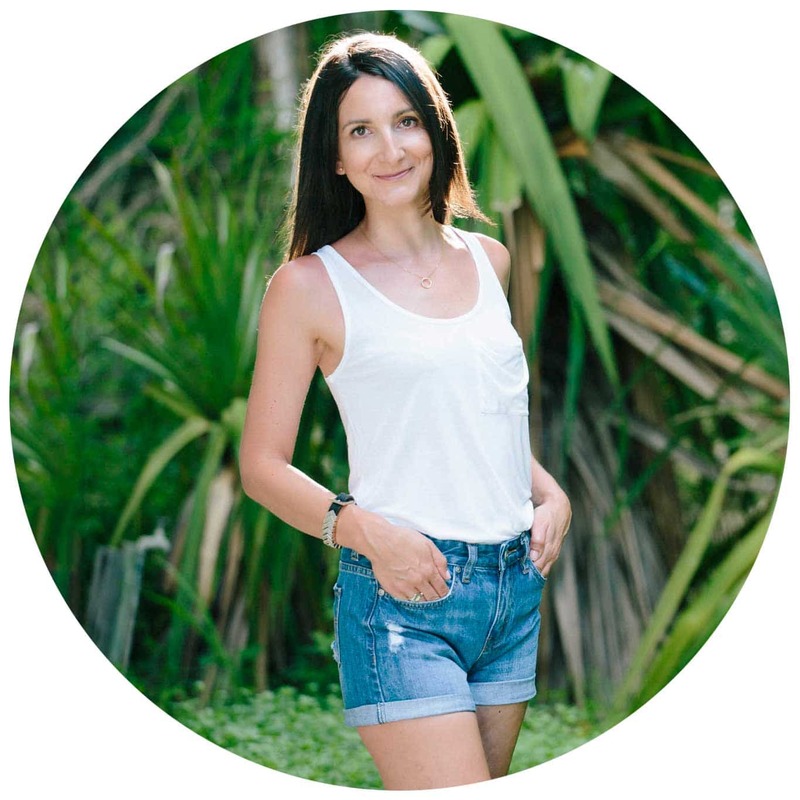 So, you’ll be pleased to know that a welcome side effect of consuming all the kale and Brussel sprouts is their ability to induce phase 1 of our liver detoxification process and you can look at it like this – salad in one hand and a glass of rosé in the other… it’s all about balance and it sounds kinda perfect to me! 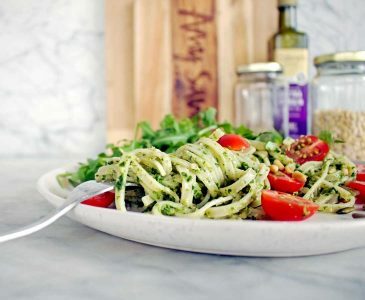 Kale – Aside from liver detoxification, kale is a good source of fibre, vitamin A, vitamin C and calcium and includes a small amount of iron too – adding lemon juice to the kale in this recipe will help to increase the absorption of the available iron. Brussel Sprouts – Similarly to kale, Brussel sprouts are also a winner for giving your liver some love, You may also be surprised to know that Brussel Sprouts are higher than a lot of other vegetables in protein content and just 4 Brussel sprouts will give you approx. 2.5g protein. Lemon –Lemons are not only rich in vitamin C and potassium, but they are rich in phytochemicals increasing the antioxidant capacity and anti-inflammatory properties. Extra Virgin Olive Oil (EVOO) – Studies have shown that consuming EVOO with meals can help to reduce blood pressure, cholesterol and risk of type 2 diabetes. And just like lemons, it also acts as an anti-inflammatory. Pre-heat the oven to 160 degrees. Whilst the oven is heating prepare the kale by removing the leaves from the thick stalk of the whole bunch, rinse and loosely chop. Next prepare the brussel sprouts. Remove the outer leaves and trim the stalk and thinly slice the brussel sprouts and place onto a non-stick baking tray (or line with baking paper) and add 1 tbsp of extra virgin olive oil and rub through. Don't put in the oven just yet..
Next, juice half a lemon and add 4 tbsp of extra virgin olive oil and thoroughly stir together. 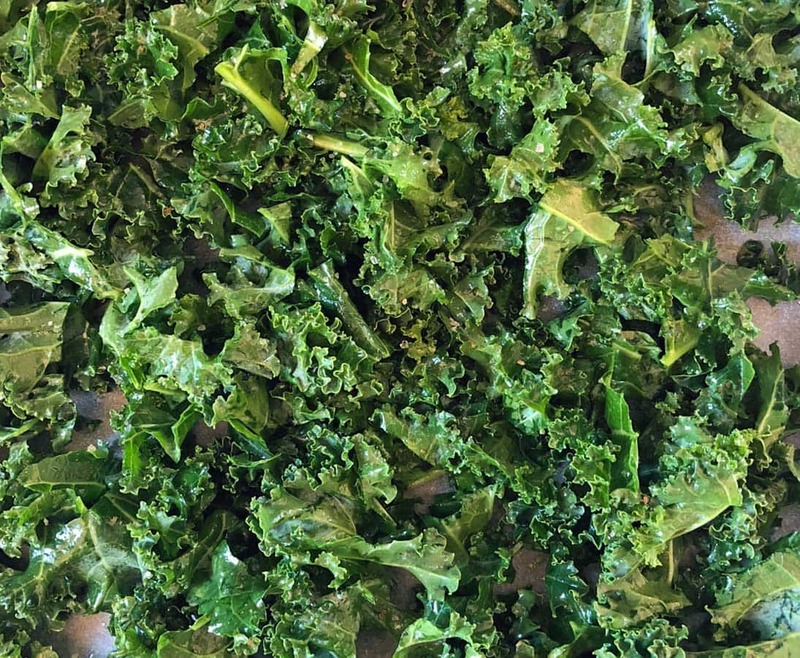 Take 1/3 of the chopped kale and place on a non-stick baking tray (or lined with baking paper) and spread the kale across the tray. Add 2 tbsp of the olive oil and lemon juice mix to the kale and using both hands, rub the mixture into the kale and sprinkle some salt over. Place both the kale and brussel sprouts into the oven. After 10-15 mins give the kale a stir through and the same with the brussels (in case if your oven is anything like mine and it always cooks one half quicker than the other!). The kale will be ready after 20-25 minutes and remove from the oven. It should be crispy, but not burnt. Turn the oven up to 200 degrees and leave the brussel sprouts for another 10 minutes until roasted through and browned. A few minutes before the brussel sprouts are ready to come out of the oven, add the sliced almonds to the baking tray to brown through for a couple of minutes. Whilst the kale and brussels are cooking through place the remainder of the kale into a bowl and add the remaining lemon juice/extra virgin olive oil mixture and massage the mixture into the kale until it really softens. You will notice the volume of the kale will reduce as the leaves soften. Once the kale crisps and brussels are ready add to the soft kale mixture and toss through, saving a little bit of the crispy kale to place on top of the salad. 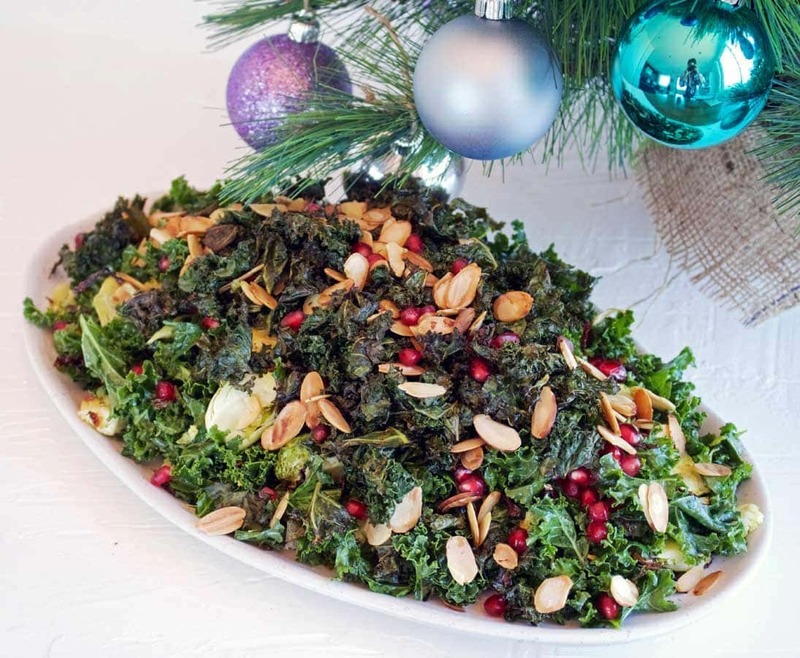 Once the salad mix is ready, place onto your serving bowl or platter, add the remaining crispy kale, all of the pomegranate and roasted sliced almonds to the mix to decorate and your Crispy Kale & Brussels Salad is ready to serve. Baking tray - if you only have 1 you can cook the kale and brussels either together or one before the other. Really massage the kale - this makes it so much softer and easier to digest. 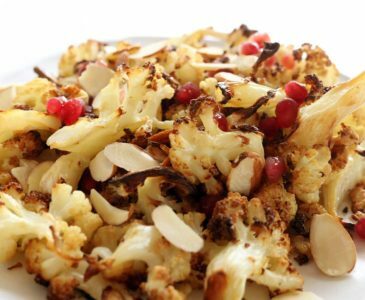 I’d love to hear your feedback on this recipe, so please feel free to leave me a comment below and if you like this one, you might also like my simple Kale & Lemon Salad or my Roast Cauli Salad.